Our Color Spotlight of the Day is… Stormy Night granite! 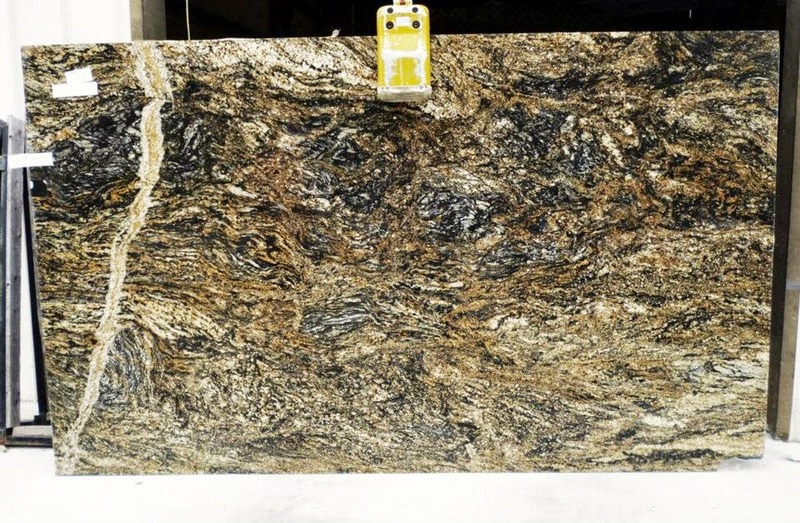 This is an exotic and stunning granite color that is made up of intricate patterns and veins of gold, black, brown and grey. This granite is quarried in Brazil and is famous for its unusual patterns throughout the slab. When you look at it from a distance, its dominant gold color is highly noticeable. However, when you take a closer look, you will be mesmerized by the intricate details of its pattern. The colors are blended well, and they complement each other harmoniously. No two slabs are exactly alike, with varying degrees of the colors within the granite. Stormy Night granite is ideal for both indoor and outdoor projects. Its durability and strength will guarantee that it can handle just about any type of usage. It is perfect for a busy household or for a commercial setting. This granite color falls under the dark-tone category of stones, which means it pairs well with light colored cabinetry. However, it surprisingly blends well with dark colored surfaces, giving an area a modern, elegant look. Stormy Night granite looks amazing when paired with Oak wood kitchen or bathroom cabinets. This granite/wood combination gives an earthy, warm feeling to a room, which in turn also provides a relaxing ambiance. It also looks well when paired with white cabinets, achieving a contemporary, clean look. The possibilities are actually limitless with this unique and beautiful stone! This is a great color choice for any kitchen, bath, or commercial upgrade or remodel. We currently have Stormy Night granite in stock but in limited quantities. It is a very popular granite color and inventory is at a first come, first serve basis. Call today to reserve your slab or visit our showroom to see this incredible granite color for yourself!